I was browsing online and came across a recipe for easy caramels. I had a craving for sweets at the time and decided to try it out. It turned out great and I even shared with the boys. The recipe is super easy and you can add your own variations to fit your tastes. DM Tip: These would make great gifts! (Mother's Day and the end of the school year are coming up.) Hubby's Tip: Don't tell anyone you made these in the microwave until after they have eaten them! 1. Place all ingredients in a microwave safe bowl. 2. Cook for 6 minutes in the microwave. Stir mixture every two minutes. 3. While the mixture heats, grease the pan. I used butter to grease the pan and it worked really well. You could also try lining pan with parchment paper. 4. When finished cooking, stir again and pour into pan. 5. Cool. I placed in the fridge for 8 minutes and then let the caramels finish cooling on the counter. 6. Cut with a sharp knife (like a large paring knife). I found if I rubbed the knife on butter, it did not stick to the caramels. 7. 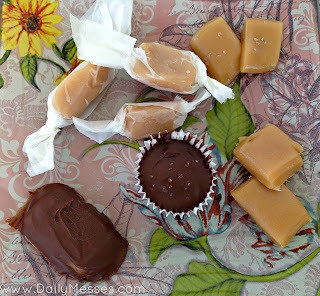 Cut pieces of wax paper and wrap caramels. 8. Store in an air tight container. DM Tip: If you store in the fridge, the caramels will be a lot harder. I have a weakness for turtles. The nut/caramel/chocolate combo gets me every time, so I made a few variations to the caramels. Make turtles! Use a cupcake or mini cupcake wrapper to form the candy. I placed a small amount of melted chocolate on the bottom of the wrapper. Next, I placed peanuts or cashews (I made both versions) on top of the chocolate. I placed in the freezer for a few minutes to harden. I then placed a piece of caramel on top of the nuts and spooned melted chocolate over the top of the caramel. I placed back in freezer to harden the chocolate (just for a few minutes). Alternative: You could place nuts on the bottom of the wrapper and the spoon the hot caramel over the top. Place in the fridge for about 10 minutes to set the caramel. Spoon melted chocolate on top and place back in the fridge to set the chocolate. What goes great with caramel? Chocolate! Spoon melted chocolate over the cooled caramels and let set. DM Tip: Place caramel on a piece of waxed paper and then spoon chocolate over. Place in fridge or freezer for a few minutes to set. Sprinkle sea salt over the top of the caramels before they cool. The saltiness can bring out the flavor even more.